To prepare the caramel: Pour the sugar and water into a skillet over medium heat. Once it has melted swirl it around the dish to coat the bottom and side, carefully. Allow to cool. Pour the mixture into the dish with the caramelized and cooled sugar. Place the dish in a double boiler (i.e. bain-marie or baño maria) and place the whole thing in preheated oven. Once done let it cool for at least one hour before removing from pan. Refrigerate it and serve it cold. Decorate your serving plate with whipped cream, slices of guava or wild strawberries to dazzle your friends and family. Cream cheese flan with guava, or Guava and Cheese Flan, is the dessert I prepare the most during Christmas time. Everyone I serve it to, young or old, loves it! It goes with Christmas Eve and New Year’s Eve dinner, and yet it’s lite. 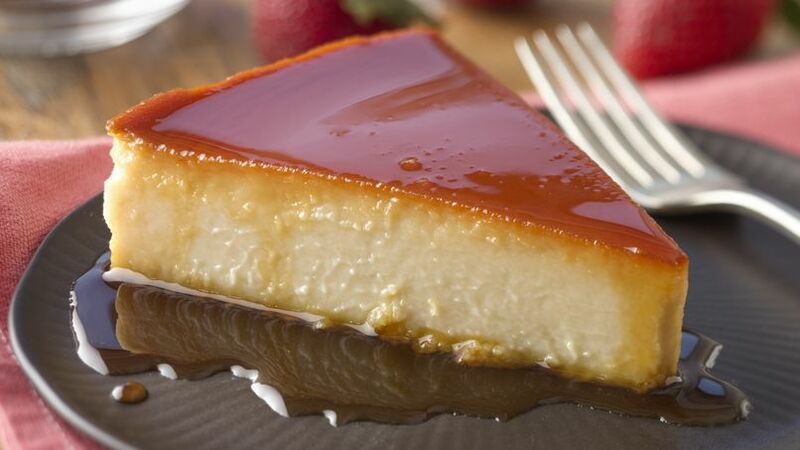 What I appreciate the most is that I can prepare this cream cheese flan with guava recipe two or three days in advance, and it keeps very well in the refrigerator. I invite you to try it. I bet you’ll find that the guava blends very nicely with the traditional taste of cream cheese flan.